Home > Forum > Triathlon Forum > What LED rear light will work for aero seat post? What LED rear light will work for aero seat post? I've got a Cervelo P2C, with an xlab cage thing off the seat, Adamo Road saddle back there. So, I've rigged up a rather unreliable rubber band to hold a rear LED super-flash. The rubber band is tied between the two carbon drink cages, and is clipped into the rubber band. The super flash, comes off and is not secure. The standard seat post device from which the LED rear light attaches is intended for round seat posts, I have found none to be able to go around a seat post like the P2. I guess what I'm asking is what rear LED red warning light are ya'll using with an aero post and XLAB cage? What fits around that cage or seat or seat post, to warn traffic behind you, not to KILL YOU. The Lights and Motion Viz 180 shown in one of the posts there. Though I never got around to putting one on my tri bike...I just clip the tail light (Cygolite HotShot) to the back strap of my helmet when I need it. That won't fit on p2. These options are very nice. Best option, you might need to add an 'o' ring extender. Crazy bright. This works nicely too. I used it on my p3 this week. Super bright. The Light and Motion rear mount 180 does fit on a Cannondale Slice aero seatpost. That,. sir, is genius. Had same problem; embarrassed I didn't think of this myself. "The best things in life make you sweaty." -Barbara W.
I confirmed that my two serfas light suggestions fit very nicely and snugly on a p3/2 carbon seat post. You could add just the 3/4 PVC tube to make theme fit even snigger, but I don't think it is necessary. Consider getting the serfas that I suggested. It will work right out of the box, is lighter, rechargeable, and substantially brighter. Put your superflash on your helmet. As mentioned above- the Serfas can be mounted on a P3/P2 or most any aero seatpost without having to go through the process of cutting PVC and retrofitting an aero post into a round post. It works fine just by itself. I also tried a small cut piece of foam pipe insulation- as sold at any hardware store, and it makes the aero post a bit rounder and even snugger fit. Also, if you have a decorated Christmas tree hanging off your seatpost/seat- the light can be mounted upside down- towards the brakes and still tilted appropriately towards the eyes of drivers in cars AND/OR it can potentially be mounted where your seatstay becomes one piece above the rear brake. I can mount it there nicely on a size 54cm S3 Cervelo aero road bike. light on cervelo S3 size 48cm - an a 54 cm S3, I can nicely mount the light on the seatstay, just above the rear brake bolt. serfas thunderbolt option for P3 without any foam pipe backing (it also goes nicely on many seatstays- for additional light). Electrical tape is your friend. 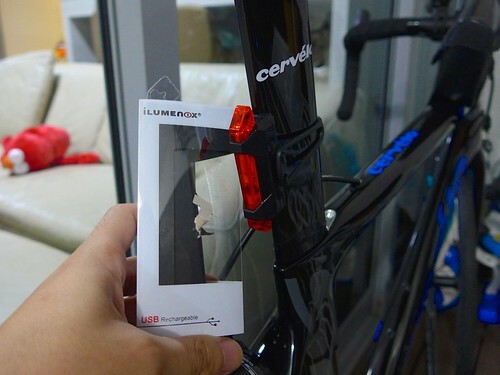 Most rear lights can be mounted on any frame by channeling a little inner McGyver! You can indeed mount the Dinotte on a P2, I just came back from a ride with mine, but instead of attaching it to the seat post, I attached the mount to the frame right above where the rear brake mount is. Mount it "upside down" so the mount points upward, and you are good to go. I have a battery pack one so I attach that to the seat post. I'd take a picture but I am way too lazy to go out and do that right now. I am a big believer in the Dinotte over the AAA powered lights, at least for daytime riding. I am using this, fits aero seatposts very well with industry grade silicone bands. They come with a small wedge for aero posts. Where did you buy this? I can't find any US dealers. Can get on Ebay but comes out of Taiwan. I used to Blackburn fleas. 1i clip to the back of my helmet the other a clip to the back of my jersey that way they're high enough for everyone to see. 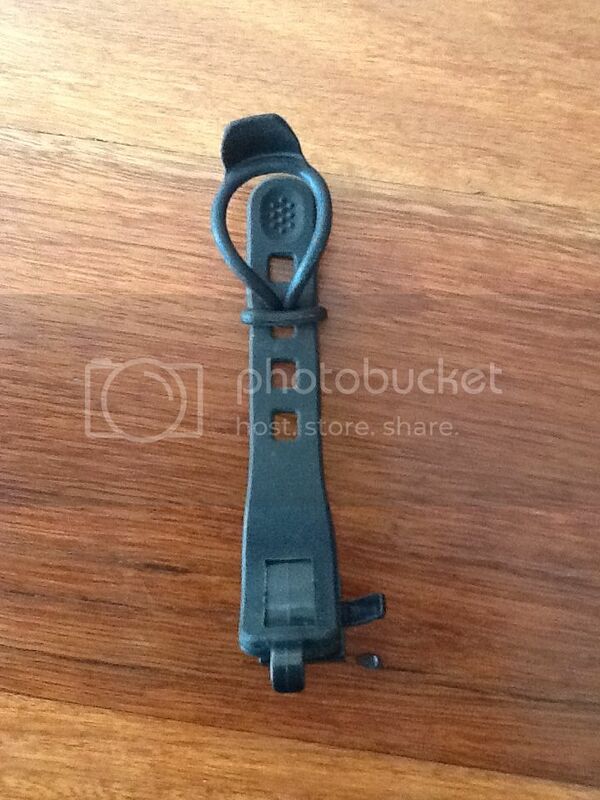 They are very small and have a nice strong clip in the back easy to use. I have a P3 and I use the Serfas thunderbolt. It is super bright and rechargeable. Easily changes back and forth between my P3 and S5. The new fly6 now by cycliq works great on aero post. Light and camera all in one. Just received the new version and love it. I saved the OEM reflector mount.... you know the things the CPSC requires come on every bicycle sold in the USA. The Bontrager Flare series will bolt right to it. I've been using it since 2010, no issues. Your LBS might have some extra lying around, or could order one possibly. Just use the bike's included rear reflector mount and then mount a 2-hole light instead of the reflector. sorry for the late reply, Christmas period is busy for me.